Taboola has an algorithm to optimize ad buying for CTR context. In Taboola, selecting Optimized will use their algorithm to drive traffic. Selecting Even spreads ad traffic evenly across images. Click here to read Taboola's official support page on these optimizations. During the Add Campaign process you can select which Traffic Allocation you want to use on the Ads step of the process. 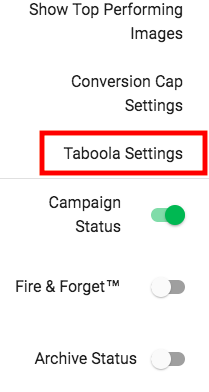 You can also edit the Traffic Allocation on the Campaign Details page for Taboola campaigns. Both of these can be done without having to log in and edit the Traffic Allocation for every Taboola campaign you're trying to manage! Why Change it to Even? We recommend to always change the Traffic Allocation to Even to gather the best data to maximize your potential with Taboola for new campaigns.